Hey there, I just wanted to let you all know that Stampin' Up! 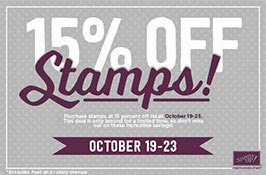 has put ALL stamp sets on sale for 15% off! What a great deal that is! So, if you have been eyeing that favorite stamp set from either the annual catalog or the holiday catalog, now is the time to get it. This sale is only until Friday so be sure to not miss out. Just click the "shop now" button above and pick out your favorite sets! While I am here, I have to tell you, I recently purchased the Lockdown Punch Holder from Stamp n Storage....OMG! I am so in love with this product. I can now easily grab the punch I need without toppling over all the other punches and not pinch my fingers because they are all packed into a basket. This is furniture quality and looks beautiful in my craft room. I have now placed an order for the marker storage and hope to soon get the ribbon holder and the combo ink pad holder...oh honey....I know what I want for Christmas!!!! I hope he can hear me! But if you're on the fence about ordering, don't hesitate. This company is fantastic and I guarantee you won't be disappointed!